Almost a year ago, when I noticed the obituary of an aging acquaintance named Ralph Feffer — he was in his late 80s — in the ARIZONA REPUBLIC of October 4, 2014, it triggered memories which I’m only now committing to paper in more detail than I’ve ever written in the past. Both Ralph and his late brother Bob attended Phoenix North High School back in the mid-to-late-1940s where classmates and friends there also included the late Max Dunlap. As noted in that obituary, “Ralph continued childhood relationships throughout his entire life.” After Max was charged with and subsequently convicted of being the man supposedly behind the 1976 car-bombing of reporter Don Bolles, Ralph and brother Bob became steadfast members of the Dunlap Defense Committee, absolutely convinced not only that Max was innocent but that he had been set-up as a “patsy” by corrupt attorney Neal Roberts, possibly in cahoots with Brad Funk, with Roberts as the true architect of the plot. Coincidentally, Roberts and Funk also had attended Phoenix North High School back in that same time span. All of these folks knew each other. Executive Tower, 207 West Clarendon Avenue Phoenix. Soon after I began writing for the old SCOTTSDALE PROGRESS in 1979, I became interested in a building called the Executive Towers at the corner of Clarendon and Second Avenue in midtown Phoenix. It was the only 20-some story highrise in that area whose upper floors looked down directly at the nearby parking lot at the Clarendon Hotel where Bolles’ car had been blown-up by a line-of-sight remote control detonator. 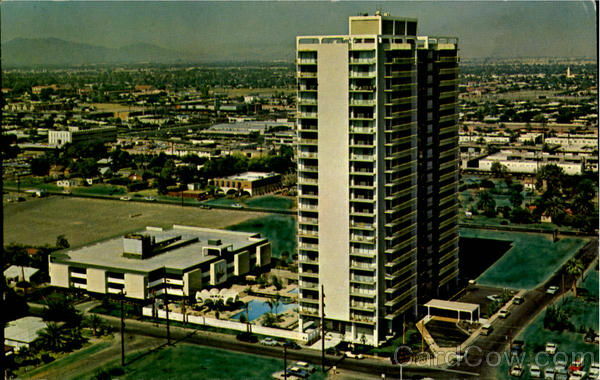 In 1976 the Executive Towers was in the process of being converted from rented apartments to individually owned condos, and most of the upper floors were still vacant. The Funk family previously had rented unit 21-H for years, the balcony of which offered a perfect view of the adjacent hotel parking lot down below. It looked to me, especially given the emerging likelihood of Brad Funk’s complicity in the crime, as an ideal spot from which a hired killer could have done the job. (1) The many unsold condo units had been available through so-called “multiple listings” in 1976 to any licensed real estate agent and thus easily accessible. One of those around the edges of the Bolles crime, a close associate of Neal Roberts named Hank Landry, indeed had such a real estate license. For his known actions in and knowledge of the plot, Landry readily could have been charged himself as an accessory both before and after-the-fact. (2) But there was even an easier way for anyone alone to get unobserved into the Executive Towers. A swimming pool behind the building could be exited via a walkway into the basement from which an elevator connected to all floors above conveniently bypassing the security desk at the first floor entrance. (3) Security records even revealed, among a number of curious incidents, some strange activities detected on the 21st floor leading up to the Bolles bombing, including possible unauthorized entry into unit 21-H — lock still unchanged from prior Funk family occupancy — in what may have been a trial run. (4) There was a garbage chute on every floor, dropping down into a trash compactor in the basement. My personal suspicion is that the remote control device used to detonate the Bolles bomb, and which never could be found, was so disposed. Phoenix PD never even bothered to check out that obvious possibility. (5) From the building staff I acquired all of their security records for a few months leading up to the June 1976 car-bombing, later offering them to Phoenix PD in a related article in the SCOTTSDALE PROGRESS. Sadly, however, no one ever came knocking, so today I still have all of those records stashed in the same briefcase furnished at the time by Executive Towers staff. Eventually they now are destined to join the rest of my extensive Bolles case files in the archives of the Arizona State Library. 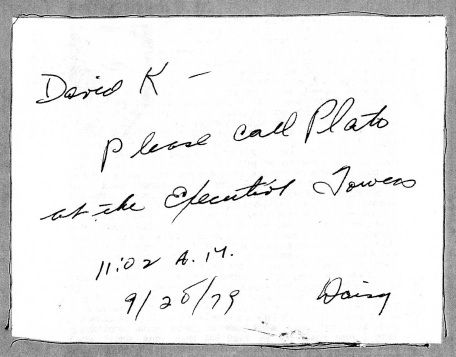 Phone message from Plato Jones to David K. Funk. Click image to see full size. The story also took a curious turn. Soon after my September 1979 exploration of the Executive Towers and acquisition of its 1976 security records, a Funks’ Greyhound Racing-related source provided me with a phone message which had been received right on the heels of that visit. Plato Jones, one of the Executive Towers security staff which had been so helpful to me, evidently was inclined to cover himself by playing both sides. That phone message — see adjacent copy — suggests that he was attempting to warn Funk family patriarch David K. Funk that a journalist had just been poking around asking pointed questions about his nephew Bradley. Ralph Feffer’s obituary made note of his well known personal inclination to insist, whatever the issue, that he “was always right.” Even though justice clearly wasn’t done in so far as Max Dunlap was concerned, Feffer always continued to believe — and was absolutely right in doing so — in the innocence of his old friend. I thoroughly enjoyed the two posts you sent me. Thank you for writing them! Hi… It’s good to hear from you, and thanks for the supportive suggestion. Yet when it became apparent that the misguided old guard including George Weisz, Bill Shover et al effectively were shaping the anniversary events, especially with Don Bolles’ widow Rosalie and daughter Diane in town for them, it clearly would have been unkind to turn them into angry and contentious affairs. The best thing that I can do is to continue posting what I’ve come to know on my website, much more to follow. I’m quite confident that those who already understand the truth will continue to do so, with many of those who now don’t eventually coming to grasp it as well. Don, you may have heard since from other attendees, but IMHO I believe the attending Bolles family members were plenty well traumatized by the detailed day-of first responder presentations made that evening. Only well-intended outsiders could have allowed such a fiasco in the presence of surviving family members. The crowning moment put 6 sticks of dynamite to song by one well achieved songster who was unaware of the false crux the reporting of “six sticks” plays in the coverup. The venue says they see a surge of tourists on the anniversary date each year. How about June 2, 2017 (41 years later; and 40 years since the IRE published “The Arizona Project”) we mount a TRUTH EXHIBIT on the roof? Thanks for your sensitive words of wisdom. And I applaud the idea of a “Truth Exhibit” on the roof of the Clarendon Hotel next June. Let’s indeed give that some serious thought! In 1976 Don Bolles taught me that carbon paper was more valuable than toilet paper. Since then I’ve learned you can spread the dissemination of the truth with one, and wipe your bum with the other. It’s when a person wipes their bum with carbon paper that things get strange. That’s what happened in 1976. The justice system in this state and those who control it, wiped their collective bums with Don’s proof of truth. Today, some still do, as was evidenced after the 40th Anniversary commemorative event 6-2-16. Hello, Susan… and amen to that!